A 100% improvised and hands-off original routine with business cards. Effect: Two spectators (one liar and one truth-teller) draw two different objects (or names, words, etc.) on a business card. They swap their cards and pens as much as they want (or they are shuffled by a third spectator), and hide them between their hands or in their pockets. It is impossible (really) for you, to know which spectator has which drawing, which pen they used, who lies and who tells the truth, etc. You really know nothing. And yet, with only one question, innocent and justified, to only one spectator, you reveal the drawings they hide in their pockets, apparently just by listening to their (lovely!) voice. Important: During this entire routine, you could have your back turned, or be over the phone. You do not need to see or touch anything. Can be done with 1 or 2 business cards. Effect: Two spectators draw two different objects (or names, words, etc.) on a business card, while your back is turned, and yet, without any question at all, you reveal which object they drew, apparently just by looking in their (lovely!) eyes. 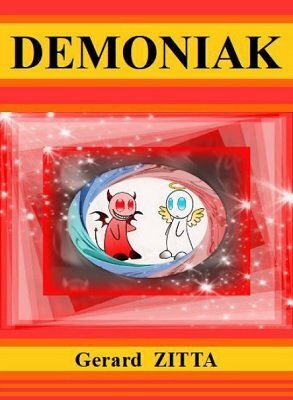 Diabolik and Demoniak can be combined in any order, or done separately. They look identical but both methods are very different. Very easy to do. In 5 minutes you will learn both secrets, but presentation is key. Practical: No special restrictions (light, props, climate, temperature, noise, angles...), nothing to carry with you. No reset. Simple: No sleight, no memorisation, simple plot. No risk of errors: The combination of Diabolik and Demoniak is 100% surefire. Universal: Adaptable presentation (any drawings, any words, any names, etc. ), customizable (can be adapted to any occasion), can be done on stage (with larger sheets of paper instead of business cards), parlor, close-up. Organic. No nonsense process. Every detail is justified. Does not look like a puzzle. 1st edition 2018, 25 pages.